Games are fun, but I sometimes get the impression they don't like us all that much. It doesn't matter how many times you have levelled up or how many weapons you have strapped across your chest; the game is in charge and won't hesitate to prove it. The majority of video games entertain us by making us feel awesome. They might transform us into the ultimate warrior or the most resilient survivalist or the greatest sportsmen there has ever been. Games lift us up and allow us to feel superior. However, before that feeling of awesomeness can turn into arrogant smugness, games can always find a way to keep you level-headed. So the game gifts you with the skills and abilities to perform the exceptional, but it can always bring you down to earth and also remind you who the boss is. You think you're the world's greatest, but boy/girl you are not. Below are some of the ways a video game can remind you that you're only as strong as the game allows. I'm a fan of real life gravity. It's one of the most dependable aspects of my life. Sure, I may curse its existence if I trip up or when I try and to carry too much at once, but it can be relied on to always perform as expected. Video game gravity is less predictable. When the game permits, you can often ignore death from falling by using a glide ability or using another human being as a big squidgy cushion. You can sometimes double jump or super jump your way to higher platforms. In a few games fall damage is ignored entirely. That is, until you fall or leap into an area you weren't supposed to be, and then the game will hurt you. I've poked fun at Kratos in the past. Never to his face, of course. I thoroughly enjoy the character – no one does "rage-filled" quite like the God of War – but his fluctuating levels of strength and badassery cause me to chuckle. For example, Kratos is capable of leaping from a balcony ten stories up and surviving the fall. If he swings his blades around, Kratos will suspend himself in mid-air for a brief moment, as if gravity itself has stepped back from his spinning, stabby things. Conversely, if Kratos falls of a beam or leaps from a platform that he wasn't meant to, the game will drop him like a stone. A big, angry, shouty stone. You might be playing as the actual God of War, but you'll still follow the path the game has laid out for you. Furthermore, consider how many games worlds have spikes in them. Not content with pits for the player to fall into, game designers enjoy adding giant metal barbs liberally across each level. This was a point suggested by a reader (Voltaire Crescent) who highlighted that even the blue hedgehog must take care when running headlong across the horizon. I find it quite difficult to believe that these spikes are natural parts of the landscape, especially in the Green Hill Zone, but I also find it challenging to accept that Eggman left them there. Having seen how devastating spikes are to Sonic's progress, I can't imagine why the moustachioed villain doesn't abandon all robot building efforts to begin mass producing the large metal barbs, coating each world with a layer of murdery goodness. 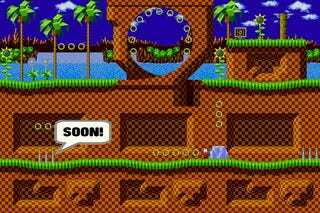 The reason why Eggman doesn't do this, is that the game wants you to spend most of your time running at speed and bounding across chasms; the game only wishes to occasionally impale the hedgehog, just to point out who's really in command. I once had to break open a door in real life. A roommate had locked themselves out of their room and needed to get in urgently. I rang the (very understanding) landlord and they agreed that I could force my way in providing the repairs were paid for. Whilst I considered trying out the film-favoured, boot-to-the-door method, I realised that probably wouldn't go the way I imagined. So instead I went for the more standard shoulder barge. On the third attempt I popped the latch out of the frame and the door flung inwards. For a brief moment I thought I looked supremely heroic, but I was told later that my expression of gleeful surprise (I cannot believe that I broke open a door I'msoawesome!) ruined my moment of machismo. The point I'm making here is that even I can force a door open. For countless, mighty warriors the sealed, locked or barred entrance presents an impenetrable barrier. Regardless of physical strength, magical prowess or natural ingenuity, so many doors stay shut, at least until the game allows it. Games often revel in this unseen power by patronising the player, explaining exactly why the player cannot pass. Nope, you can't open that old, possibly rotten wooden door until you have the right key. This door cannot be opened until later on in the game for reasons I haven't quite made up yet. And this door can only be unlocked from the other side. It doesn't matter that your double handed sword could easily carve through it or that your shotgun could take the thing off its hinges; that door isn't moving until the games says its fine. It's a good job Gordon Freeman is mute. If he could speak, I've no doubt he'd be the first to ask why any entrance or exit is closed to him when he his walking round with the perfect tool to prise any barrier apart. How many times must he wobble a door handle, look to his crowbar and then sigh heavily. On the other hand, I may be giving Mr Freeman too much credit. He may be an intelligent scientist, but he'd rather smack a wooden crate until it breaks than simply pull the lid off. Even in games which bless the player with a lock picking ability, you'll still find doors that cannot be opened for reasons unknown. The door looks exactly the same as any other, but the game delights in reminding you that this particular gate cannot be opened until the appointed time. And in the case of Dead Island, where you are given permission to break down (some) doors, you must complete a button prompt in order to force your way through. Apparently even the adrenaline building up in response to imminent zombie chomping can't get the best of a video game door. Water in real life is fun. It fills swimming pools and Jacuzzis. It also fills water pistols and balloons. We can keep ourselves and our belongings clean and it keeps us alive. Without rain we don't get rainbows! But in video games, water is not your friend. In small amounts it may grant a small amount of healing, but most of the time it's trying to murder you. Large expanses of water are usually employed as game barriers. Not content with convincing the player that they must stay on land, numerous games will allow you to swim a short way out before force feeding you to a shark. Even when the lakes and oceans aren't keeping you contained, they are still inexplicably dangerous places. The number of times I have knocked out an unsuspecting shark with a jet ski in Far Cry 3 is remarkable. I'm convinced that there was more toxic waste than clean water in the original Deus Ex. More often than not a game will simply decide that you cannot swim and drown you the moment you even look at water. There's a reason why water levels are hard. They take what in-game skills you've learnt so far and throw them down the drain. You'll get them back once the water section is over, but until then you are going to be splashing around helplessly. First person action games such as Dishonored delight in taking away your ability to use weapons the moment you are more than knee deep in a river. And you thought you were being sneaky by taking the low road. And the moment you put your head under the water, you are at the mercy of that steadily falling 'breath bar'. All the physical strength and agility in the gaming world won't save you if you can't find the surface. This might seem a little obvious at first. Of course grenades will make you feel weak; they are balls of suppressed explosion ready to spread you across the landscape. But reflect on the role of grenades in action games. They prevent you from spending your hours hiding behind cover as your enemies wander towards you. Your plan of attack can be stalled entirely by that bleeping arrow that indicates that a ball of death is nearby. Grenades are also the perfect way to ensure that person who killed you in multiplayer dies too. They are a game changer. More than that, they remind you that your character is not an invulnerable killing machine. The game might allow you to take seventy bullets to the chin providing you digest the contents of a few first aid kits, but a single grenade can turn you into the rag-dolliest rag-doll in a heartbeat. The term 'bullet sponge' is nothing new to gaming; video game characters can absorb a huge amount of damage. The anatomy of a first and third person shooter must be a curious thing to study. Their flesh, muscles and sinews must have the consistency of custard – the surface glooping back into place after something has passed through – but their bones must be more akin to ice cream wafers, barely able to resist the slightest pressure. Yep, I'm poking this sore spot two months in a row. A while ago I was expressing my respect for the proper use of a good QTE, much to the seething (but very well-mannered) indignation of many readers. Whatever your opinion of button prompts and interactive cut scenes, there's no denying that the "insta-kill" style Quick Time Event puts you in your place. If you miss your cue to tap, mash or twirl the controller, you are dead in the dust no matter what the skill level you've garnered. It's not just the nature of QTEs that reminds you that you are truly feeble; it's how the game humiliates you afterwards. Should a nasty beasty take your life in the normal areas of the game, the death animation will be swift and decisive, so that you can quickly get back to trying not to die. Death from QTE is much more theatrical. The death animation will last longer than the 'Platoon death scene', with the camera turned to show the gruesome act in the most cinematic way possible. You'll probably have to watch a cut scene again too. Death in video games is abrupt and clinical. Death in a QTE event is degrading and messy. And you don't get to move on until you have learnt your lesson. Well done. Fancy trying it again on a higher difficulty? It's subtle, but the game has once again reminded you that you are not that special. You just beat the game on normal? Pfft. Everyone is normal. All the cool people play this game on 'Hard Difficulty'. Oh so you've beaten normal difficulty too? Here's the 'EXTREME DIFFICULTY' setting. Try not to cry whilst you're playing. At the end of the day, games are our friends. They try their best to make us happy. But they don't like to see us taking the powers they bless us with for granted. If are egos become too lofty or our heads become too bulbous, games will take us down a peg. And I think that's important. Challenge is an integral part of any good game, and the more ways a game can challenge us the better. If you have any other examples of games reminding us that we are weak and feeble, or you agree/disagree with what I've written, leave a comment below. If you want to you can contact me directly on Twitter @redheadpeak. If you're feeling adventurous you can click to follow my blog on WordPress or give me a like on Facebook.